White House Press Secretary Josh Earnest said that President Barack Obama stands by his characterization of President-elect Donald Trump as fundamentally unfit to be commander-in-chief. Asked whether the President still considers Trump “temperamentally unfit” and “uniquely unqualified” after the pair met for the first time Thursday morning, Earnest said that Obama stood by those remarks. “Look, the president's views haven't changed," Earnest said. "He stands by what he said on the campaign trail. He had an opportunity to make his argument. He made that argument vigorously. He made that argument in states all across the country. But the American people decided." Earnest Said. "The election is over," he continued. "The President didn't get to choose his successor. The American people did. They've chose President-elect Trump and President Obama is determined to preside over a transition that gives the incoming president the opportunity to get a running start.” Earnest also emphasized that the meeting between Obama and Trump was not meant to resolve their own personal or political divisions. House Speaker Paul Ryan says he and President-elect Donald Trump had a “fantastic, productive meeting” at the Capitol. Trump called the meeting “an honor.” He added that, “I think we’re going to do some absolutely spectacular things for the American people.” Trump may have signaled early agenda items where the Republicans agree. He said: “We can’t get started fast enough, whether it’s health care or immigration.” Ryan then took Trump, Melania Trump and Vice President-elect Mike Pence out onto his balcony overlooking the Mall. Ryan pointed to where the inaugural platform being is built. That’s where Trump will be sworn in. Trump at one point gestured toward the tower of his new hotel, between the White House and the Capitol. First lady Michelle Obama and incoming first lady Melania Trump have spoken about the challenges of raising children in the White House. Mrs. Trump’s 10-year-old son Barron Trump will become a teenager during President-elect Donald Trump’s first term. White House spokesman Josh Earnest says that’s “a rather unique childhood.” He pointed out that Mrs. Obama and President Barack Obama also had the experience of raising children in the White House. Earnest said Mrs. Obama and Mrs. Trump spoke about the experience of being a good parent under those unique circumstances. He said the two women then walked to the Oval Office to visit with the president and the president-elect. Mr. Obama said that he and former President George W. Bush had major differences eight years ago, but they managed a successful transition. He said he expected to do the same with Mr. Trump, while acknowledging that they have their differences, and he invited the president-elect to come to the White House on Thursday. Mr. Obama reminded the country that we “are all on the same team” and characterized politics as an “intramural scrimmage.” He said that he was heartened by the conversation that he had with Mr. Trump at 3:30 a.m. and that he hoped Mr. Trump maintains that spirit. Mr. Obama said that he was proud of Mrs. Clinton, who gave her concession speech on Wednesday just before Mr. Obama spoke, and called her a historic figure. House Speaker Paul Ryan avoided a braggadocios victory lap, instead simply crediting President-elect Donald Trump for a "political feat" and saying Republicans will do their part to help heal a divided country. "What Donald Trump just pulled off was an enormous political feat," Ryan said in his hometown of Janesville, Wisconsin, in his first remarks after Republicans maintained control of the House and the Senate and won the presidency. He added that Trump "earned a mandate." "Donald Trump provided the kind of coattails that got a lot of people over the finish line," Ryan said. He also noted that Trump won Wisconsin for the first time for Republicans since 1984, Now that Trump has won, Ryan said the Republican Party must "work to heal the division" created in the country through a divisive campaign. Israeli Prime Minister Benjamin Netanyahu is congratulating President-elect Donald Trump today, calling him a true friend of Israel. "President-elect Trump, my friend, congratulations on being elected President of the United States of America. You are a great friend of Israel," Netanyahu said "The bond between the US and Israel is based on shared values, shared interests and a shared future. I am sure that President-elect Trump and I will continue to strengthen the special alliance between Israel and the US and we will bring them to new heights." Putin Trump Make Global Security Great Again! Hillary Clinton campaign chairman John Podesta told supporters at the Javits Center in New York early Wednesday to go home and go to sleep while several other states tally up the remaining votes. “go home and get some sleep” Podesta told the dwindling crowd. Podesta insisted that Clinton wasn’t finished yet, though Donald Trump held a 254 to 218 early Wednesday with three key states – Pennsylvania, Arizona and Michigan – still to be called. Clinton stayed back at the Peninsula Hotel, deciding not to speak. Some Clinton staffers and supporters were also seen in tears as the night wore on and the results stared to roll in. 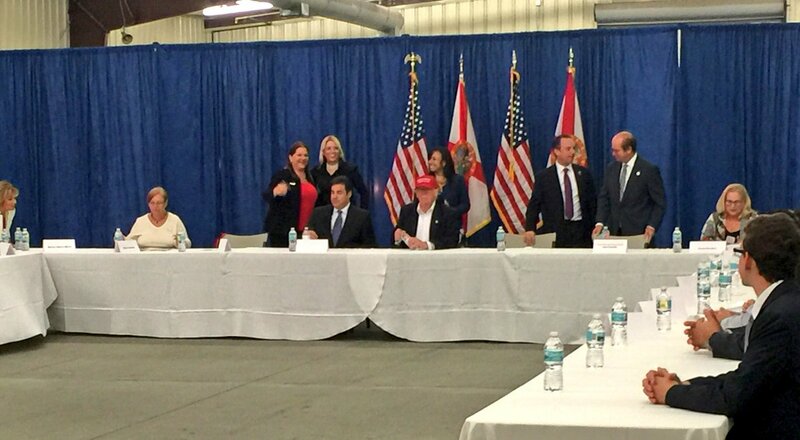 Donald Trump was right here in Orlando Florida Wednesday for a roundtable discussion with leaders of the Puerto Rican community (an organization funded by La Raza) to ensure there voices are being heard by the campaign and by Donald Trump himself, personally. The event was held at a Puerto Rican restaurant near the Orange-Osceola county border. No video can be found. Kaine was scheduled to attend a roundtable two months ago, but that was canceled and scheduled for today. As Tim Kaine made headlines about the round table meeting, Donald Trump did not.